Hollybeary Creations : YNS New Release Blog Hop!! YNS New Release Blog Hop!! Who's ready for the Nov. New Release from Your Next Stamp? Today we have a fun Blog Hop and a chance for you to Win a $25 GC to the YNS store. My first project using the new set Word Critters - Winter Birds.. This set is full of fun birds and Holiday images. I stamped the images with some Memento Tuxedo Black ink onto a piece of White card stock and colored them in with Copics. Then I die cut the circle using the Circle dies & Stitching marks die set. I adhered everything onto a White card base with a Banner cut from some Doodlebug patter paper. 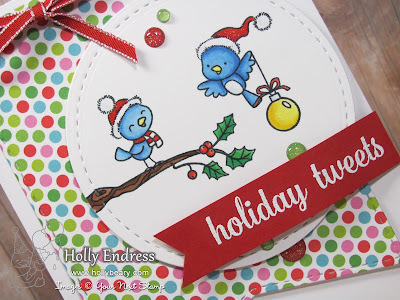 I stamped the sentiment from the same set onto a piece of Red card stock and heat embossed it with white and added it over the circle along with some of the new Holly Jolly Sparkly Gumdrops. My second project uses the new sets Waddles Food Truck Fun & the Waddles Food Truck Holiday set and dies. I created a scene with the images and I colored them in with Copics. I die cut the Image panel with the stitched rectangle dies and I created the sky with some Distress ink. The sentiment is stamped onto a piece of White card stock that I trimmed into a Fish tailed banner and added some more of the Holly Jolly Sparkly Gumdrops to it as well. Hop along with us using the Links below and be sure to leave Comments on all the Blogs for a chance to win a $25 GC to the YNS Store..
Are you ready to HOP??? Both your cards are so adorably cute Holly. Cute cards!! Love the birds. Both cards have awesome colors and design. Omygosh! Who doesn't love these cute winter birds, so adorable! Both of your creations are marvellous! Love them! Adorable! My favorite is the bird card... I love the little bluebirds!! These are awesome cards. I love penguins and birds. I'll have to get these sets. Super cute cards. I love the waddles food truck..so fun!! Oh my gosh!!!! Those cards are just tooooo cuuuute!!!! The food truck is quickly becoming one of my faves - just so many ways to use it! Super fun with the traditional colors. I think I'm gonna go broke with all the Waddles sets, but they're so stinking cute! Love the birdies, too. 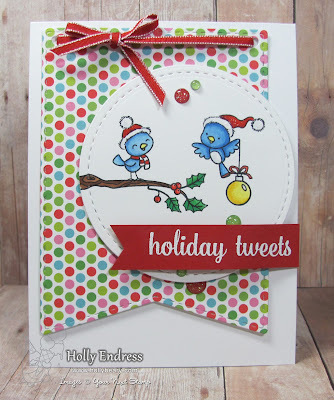 Such cute cards, Holly! The truck scene is so fun!!! The bird set is too stinkin' cute! Love your cards! So cute the birds and penguin cards. I had to smile when I saw these cards. Love when the little animals/birds are doing "human" things. Fun fun cards...those birds and penguins make me smile. Such cute cards and beautifully colored! Oh so cute! 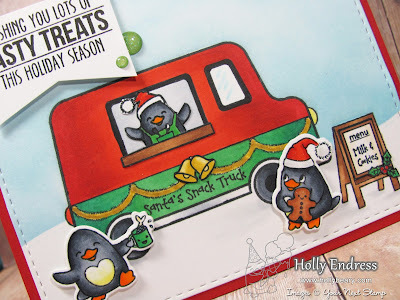 Love the Santa snack mobile! Both cards are so sweet Holly! Love them! They are super cute!!! Love the coloring and your desings! Love the winter birds and waddles! So cute! What an adorable idea to have a food truck stamp and die! Your card is sweet! Those birds are calling my name LOL! OMG, how stinking CUTE are those penguins! Must have them... NOW! The birds are too tweet. Love the penguins as well. Both designed fabulously. I love them both! I love how you colored them. The little birds are my favorite! Darling cards! The scenes are beautiful and those sweet birds are just too precious!